Hands in the air if you love a great fart joke!!! 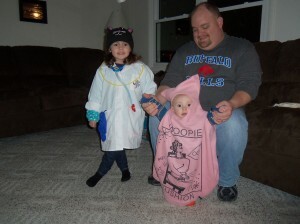 I’ve waited years to get one of my kids in a whoopee cushion costume. Check that off the bucket list. Listen lady, consider that it’s gotta be one of the best baby costumes ever, a baby is practically the only person who can rip a giant fart and have people laugh and cheer them on for more. There is no cheering section when I fart! No surprise, Cardin decided on being a doctor this year. Between my multiple hospital stays, the pregnancy, and my surgery we basically saw a doctor once a week. 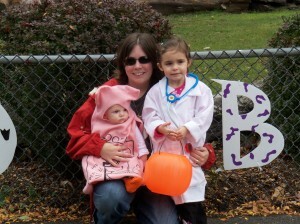 Eventually, I started taking medical supplies from each appointment to put in her “doctor kit”. I’d guess we’d be set for a sterile room operation with all her equipment.